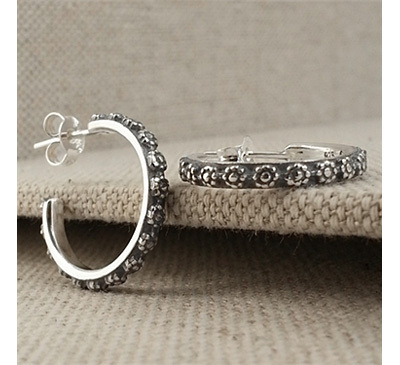 Sterling silver oxidized flower hoop earrings with decorated floral buds adorning the simple hoops. These flower earrings are handmade in Israel. Please allow 3-4 weeks for shipping. We guarantee our Handmade Oxidized Flower Hoop Earrings in Sterling Silver to be high quality, authentic jewelry, as described above.